Big River Engineering and Manufacturing is a contract medical device manufacturer located in downtown Memphis, Tenn. Because of the regulatory standards surrounding medical equipment, it is subject to regular capabilities studies by the U.S. Food and Drug Administration (FDA) to make sure its products consistently meet applicable requirements and specifications. To ensure these standards, the company required high-performance medical machining capabilities that would produce tight tolerances of plus or minus 0.03 mm on a routine basis. It also wanted equipment that would allow for unattended operation. 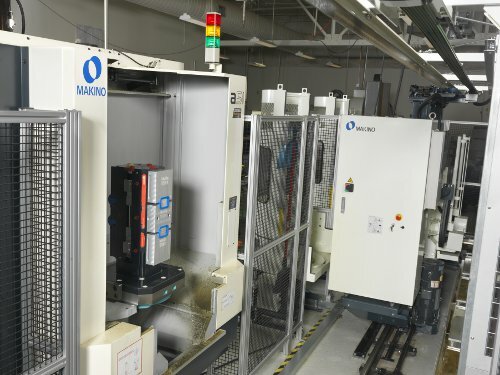 Big River turned to several companies when considering its new medical machining equipment, but only Makino could answer questions concerning the accuracy and reliability of its machines. The strong support behind Makino’s equipment led Big River to purchase an a51 horizontal machining center and an MMC2 automated material handling system with six pallets. During installation, the company sent several employees to Makino’s technical training to help enhance programming and to build the confidence and flexibility of its programmers. Big River has applied its new machining cell to producing medical parts from aluminum, titanium, stainless steel and plastic on 77 part varieties. Moving from vertical to horizontal machining centers and adding automated efficiency has given the company a 55 to 70 percent increase in throughput. Tool life has increased 15 to 20 percent because of the machine’s rigidity and through-spindle coolant technology. Using a premium coolant has increased this efficiency an additional 15 percent. Fine finishes are critical in medical parts, and accuracies must be at plus or minus 0.1 mm to 0.03 mm, and the a51 has not only met these accuracy requirements but also expanded Big River’s capabilities. Medical parts are machined completely on the a51. Less hand finishing is needed and secondary operations like plunge EDMing can be eliminated, leaving little opportunity for error. The company can run six different jobs each workday on its automated cell. Keeping this medical machining cell fed is the company’s biggest obstacle, since the multi-pallet setup lets the company maximize spindle utilization. Jobs run into the evening and overnight, experiencing spindle utilization of nearly 100 percent. Big River is also achieving 100 percent on-time delivery of its medical machining operations, with no rejections.